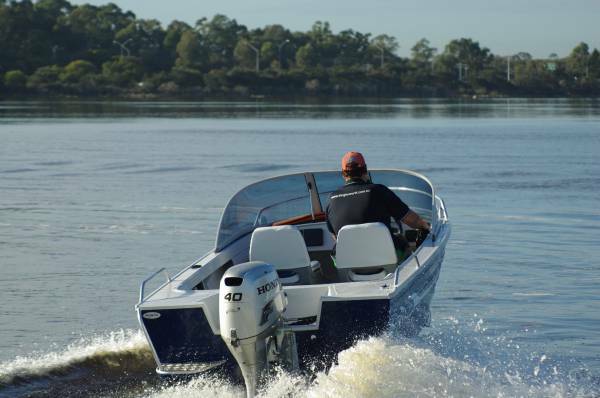 It is no surprise to anyone that boats currently selling in any numbers are at the smaller – and of course cheaper – end of the scale. Finance is not easy to get, and something within cash range has a better chance of being bought. Once the sights are lowered, buyers discover that economical does not mean second rate – as today’s review demonstrates. 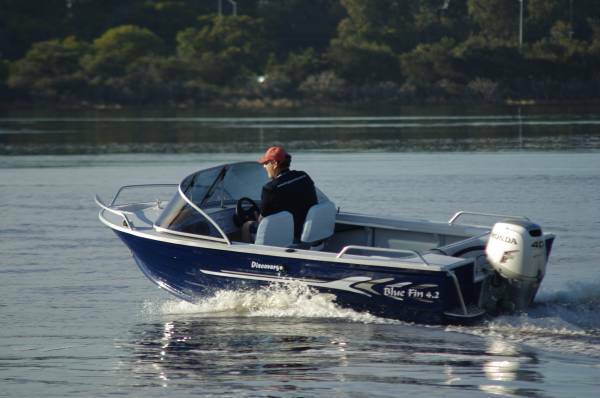 The Blue Fin 4.2 Discovery is essentially the mainstay of boating in the late 60s and onwards, although technology and design improvements have kept pace with the passing years. 4.2m might sound small, but its 14ft was mid or even nudging upper end for a fishing boat in those days, and what did the trick then should do it now. Construction is infinitely more sophisticated and far stronger. The old boats were often slightingly called ‘Alfoil’, but the pressed aluminium Discovery has a 3mm bottom, massed frames, a fully welded gunwale and a full height motor well. Old style boats used to have items welded on mid sheet, and the resulting hard spots used to cause fatigue cracks. Here, welds are at chine, keel, quarters, stem and gunwale: places with no flexing. 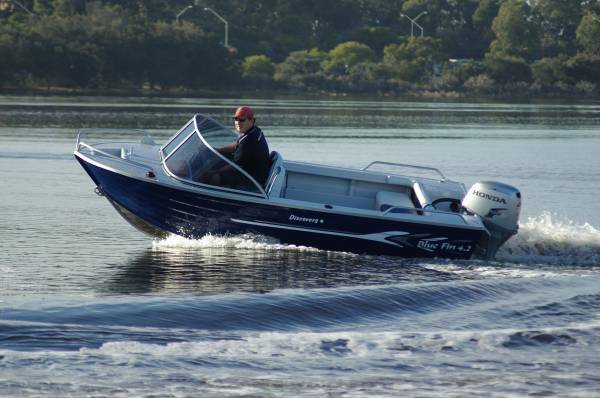 The review boat was powered by a 40hp Honda four-stroke, delivering abundant power (you could ski behind it) along with a miserly thirst. This is the fuel injected model with a lot of electronic tricks to achieve those ends. The built-in fuel tank of only 30L is not undersized: its modest volume simply reflects the fuel economy an owner can expect. There is more economy in the towing. The whole package is light enough to be effortlessly towed by just about any four-wheeler, a simple trailer with only three keel rollers carrying the Discovery. Naturally, winching on takes little energy too. Economy is one thing, getting the job done is another, so how was it in boat-type qualities? The two pedestal seats – very good ones, a far cry from the plastic stacking-chair quality of years gone by – are set well forward behind a short foredeck to maximize the cockpit. With around 170kg in those seats, I could feel the bow trimming itself down at rest, but as soon as we got moving and touched the trim button the bow rose to the right place and stayed that way through tight manoeuvres. Blue Fin has that one right. I can recall small runabouts that used to lay over on the V of the bow in turns and terrify all on board. The forward seats are mounted on the carpeted deck, and their occupants’ feet rest in a foot well. They have a comfortable relationship with the dash, windscreen and controls, and you would want to stay in them: standing to drive would be a poor idea. The rear seat uses a clever idea. It is a full width upholstered box, free to slide on the carpet guided along the side pockets by lugs on the box’s ends. 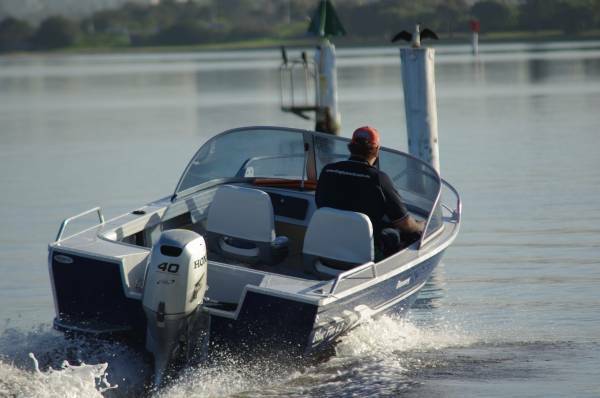 The idea is to set it aft for passenger carrying and to slide it forwards for fishing, either straddling it to fish over the side or facing aft over the transom. Or you could remove it for extra room, although you would also be removing a big volume of storage. Our boat was set up with a considerably flasher fit-out than thoughts of economy would suggest. Switch panel, bilge pump and navigation lights were factory fitted, there was a small boarding platform aft, and an opening windscreen facing an anchor well. The bow has low rails to lend a hand with launching and recovery, and more rails aft for the passengers. It is a boat ready to go. The fishing goodies common in larger boats are missing, but really, so what? A portable ice box makes more sense than a catch tank; for bait cutting invert the lid and drop in a piece of ply. Important things like space and stability are present and correct; the same 170kg tested both. 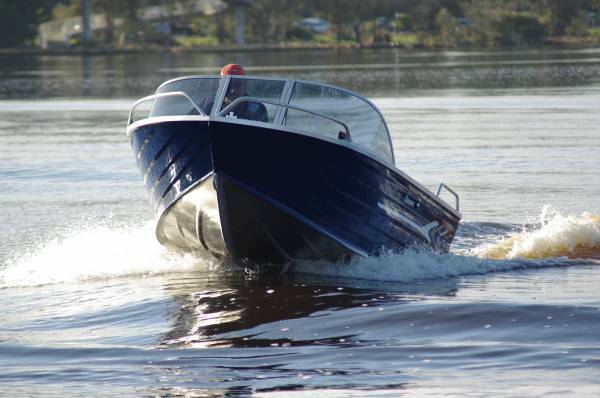 Delete some niceties and you can get this boat afloat and playing for $19,000. You would have a boat for a young family or two or three fishing mates, and all the inlets, Cockburn Sound, and the ocean inside the three-mile reef would be your playground.